Is there a food more American than strawberry shortcake? I am not so sure. 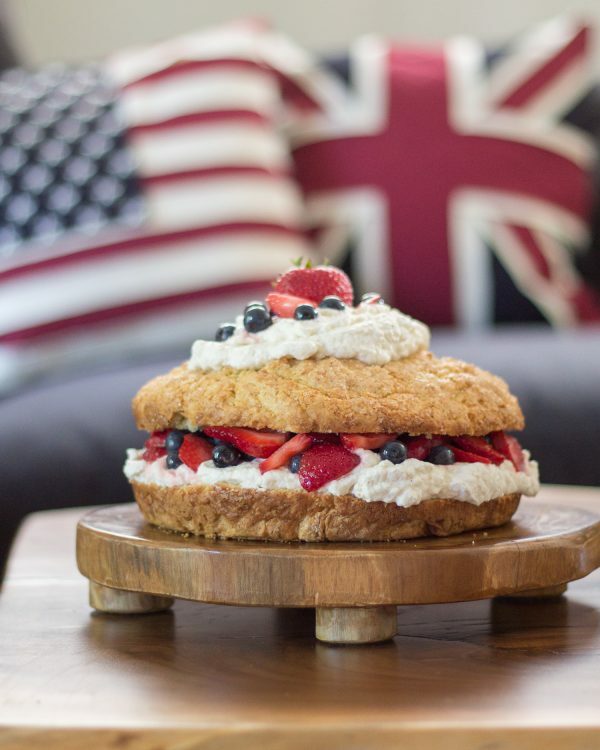 In advance of the Fourth of July, I am sharing a classic recipe for New England Style Strawberry Shortcake. 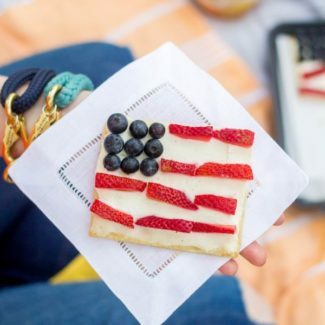 I added some blueberries to give the dessert an extra patriotic touch. 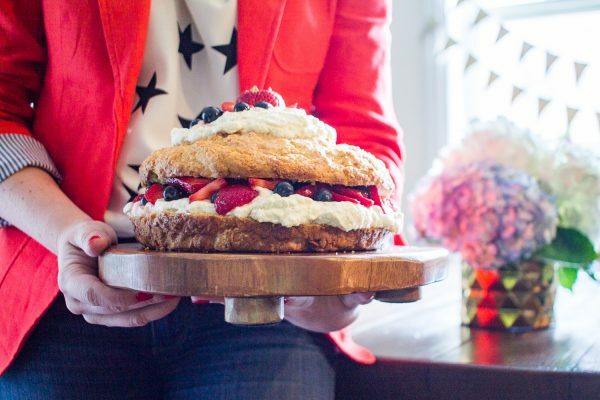 It’s a showstopping dessert that makes for a perfect centerpiece for an Independence Day celebration. 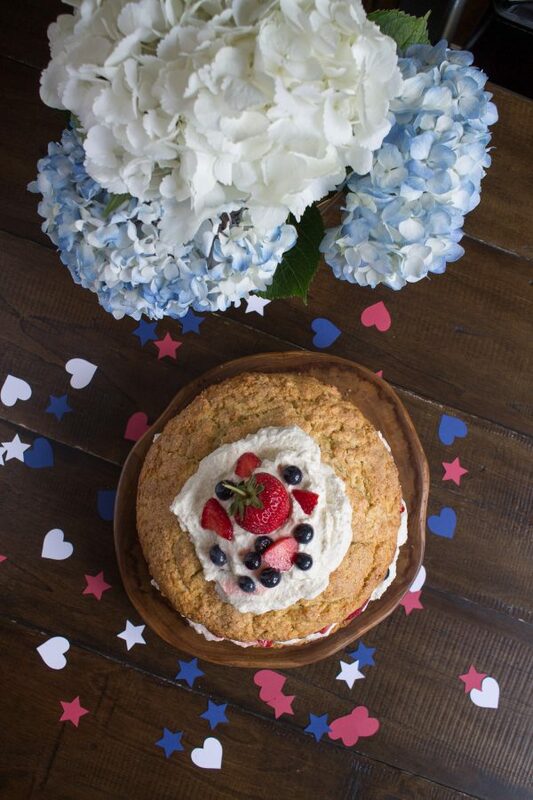 Strawberry season and the Fourth of July go hand in hand. 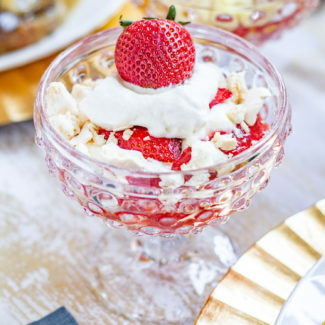 Strawberries happen to be at their peak, and this recipe is just the way to serve them. 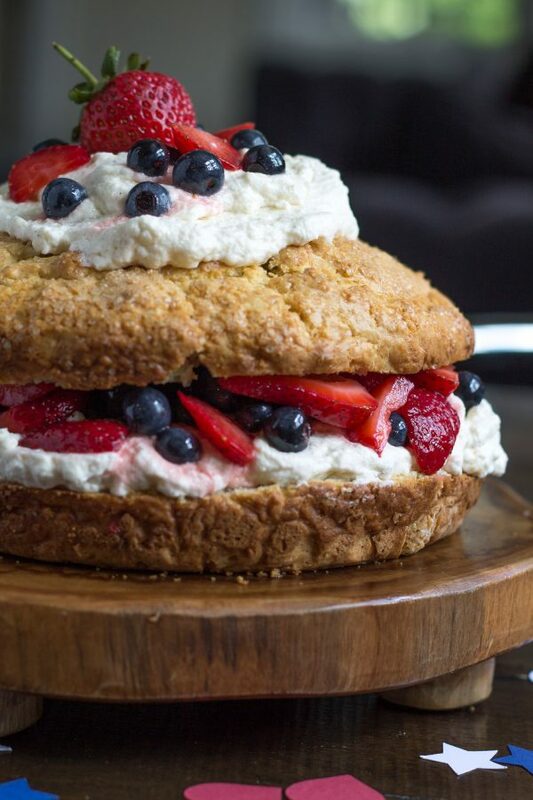 This shortcake is made with a handful of ingredients that you probably have in your pantry. Preparing the cake just involves stirring the ingredients together to make a dough, pouring it into a cake pan, and baking it. 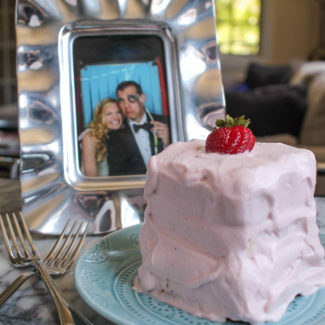 While the cake is baking you just need to slice the strawberries and make the whipped cream. 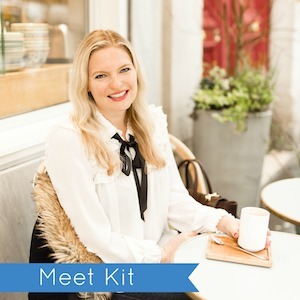 It is an easy recipe and takes under an hour to prepare from start to finish. When I was in college I learned that strawberry shortcake means different things in different parts of America. 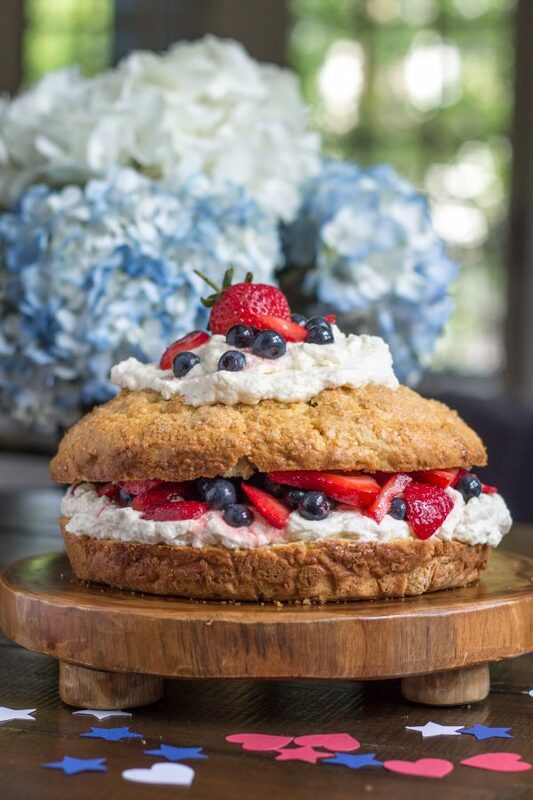 In New England, it’s a slightly sweet crumbly cake that is topped with fresh sliced berries and a big dollop of sweet whipped cream. I have so many memories of eating it as a child, and it just tastes like summer to me. 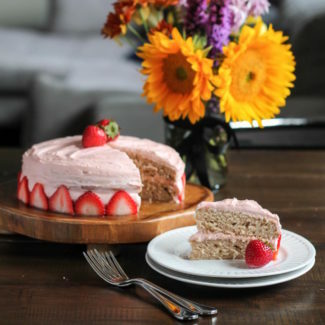 In other parts of the country, strawberry shortcake is more like a traditional cake that is topped with strawberries and a light whipped frosting. 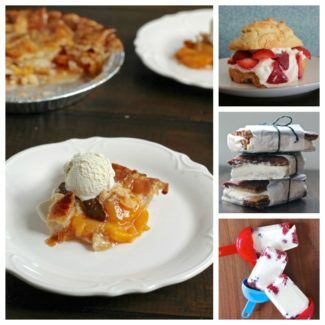 It is nothing like the shortcake I grew up eating. My Mom would serve shortcake by cutting individual slices and then cutting them in half and stuffing them with strawberries and whipped cream. Instead of individually assembling the serving of shortcake, I prepared the entire cake all at once. 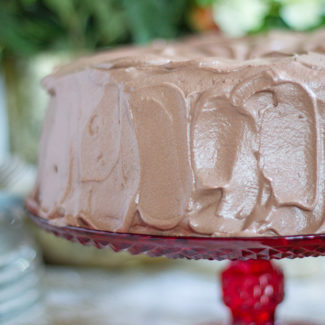 I want to let you know that you need to let the cake cool completely before you add the whipped cream, otherwise the whipped cream will melt into a mess. 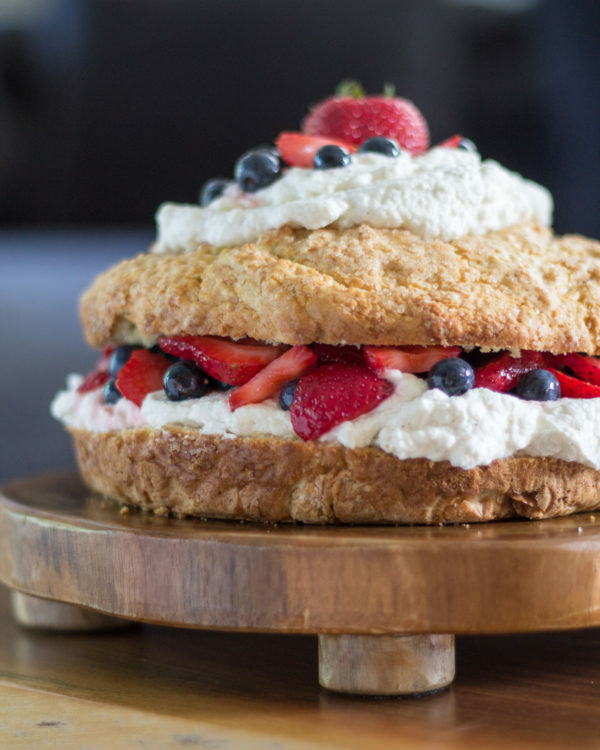 You can prepare the shortcake, berries, and whipped cream ahead of time. I recommend assembling it just before serving. First, prepare the shortcake. Heat your oven to 400 degrees. Then grease an eight-inch cake pan. Place the flour, sugar, baking soda, baking powder, salt, eggs, and whipping cream in a large mixing bowl. Stir to combine. The cake batter should have a dough-like consistency. Pour the batter into the cake pan. Bake for 20 minutes at 400 degrees, and then reduce the heat to 350 degrees and cook for 15-20 minutes, or until a toothpick inserted in the center comes out clean. Let cool completely. While the shortcake bakes, hull and slice the strawberries. Combine the strawberries, blueberries, lemon juice, and sugar in a bowl. Let sit for at least 30 minutes. This will make the berries extra juicy. To make the whipped cream combine the remaining whipping cream, sugar, and vanilla in the bowl in an electric mixer. Beat on a medium speed until the whipped cream forms soft peaks. Once the shortcake has cooled, slice it in half. Add a thick layer of whipped cream. Spoon the berries on top. 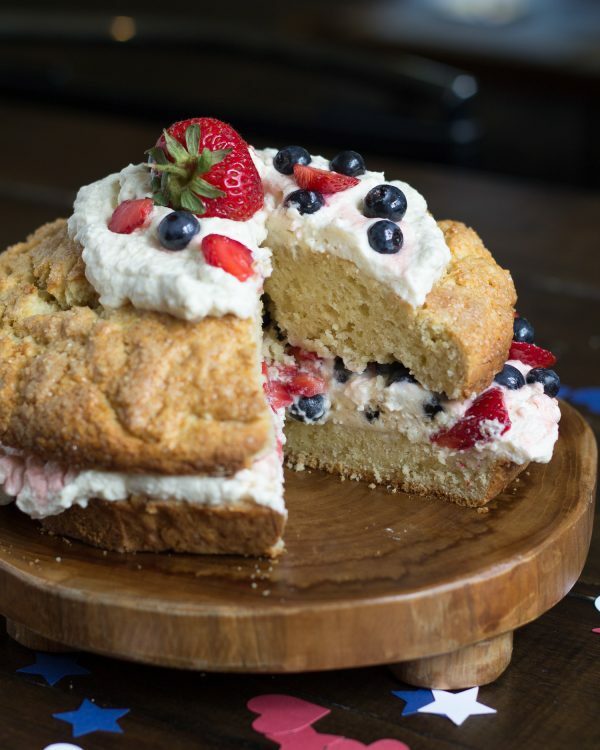 Add the second layer of cake on top and decorate with another dollop of whipped cream and some berries. Serve right away.